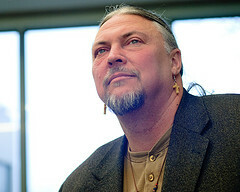 Randy Woodley is the Associate Professor of Faith and Culture and the Director of Intercultural and Indigenous Studies at George Fox Seminary in Portland Oregon. His new book is Shalom and the Community of Creation. Randy is also the author of Living In Color: Embracing God’s Passion for Ethnic Diversity. Edith and Randy run Eagle’s Wings Ministries. Randy is also a part of the North American Institute for Indigenous Theological Studies (NAIITS). In this podcast Randy discusses everything from systematic theology to Evangelicals for Justice, from Contextual Theology to indigenous voices – and everything in between.